Q. What is the best canvas for wall tents? A. Buying a quality wall tent is a substantial investment so we thought that if we included some information about canvas it would help you make a more informed purchase. 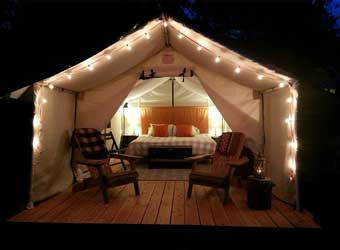 When comparing wall tents it is very important to know what type of canvas the tent is made from. 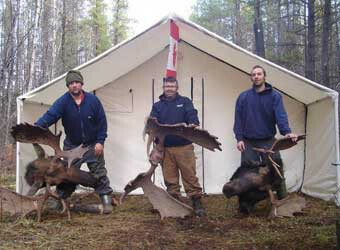 During the past few years tents from China and Pakistan have entered the Canadian market. They are sometimes sold under names that make them appear to have been built in North America. The canvas in these tents is not the same quality that you want. Sometimes these tents enter Canada from the U.S. which makes it even harder to recognize them. Ask if the tent is made with Sunforger canvas. If it isn’t the chances are pretty good it came from offshore. 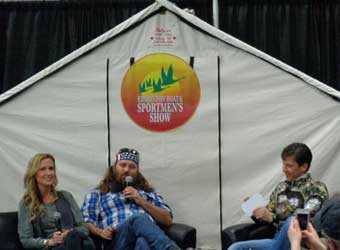 Wall tents that are built with anything other than Sunforger canvas won’t be the same quality and will be priced cheaper. Sunforger is a double weave marine grade canvas treated with fire retardant, water and mildew repellent. There are other types of treatments but they can increase the weight of the canvas by up to 70%. They are often applied to a cheaper single fill canvas and can inhibit the tent from breathing properly. Q. What does the weight of the canvas refer to? A. This is the weight per square yard after the treatments are applied. Heavier canvas quite often is a cheaper single fill with a heavy wax based treatment which can increase the weight of the tent by up to 70%. These waxy treatments inhibit the ability of the canvas to breathe properly which can lead to condensation forming inside the tent. They will also shrink more than Sunforger treated canvas. Q. Is there a warranty on the tent? A. Yes, the tent has a 2 year warranty from date of purchase. This doesn’t cover misuse. If you always make sure your tent is dry before storing it you will get a lifetime of service from it. Q. What is the difference between the Deluxe model and the Standard model? A. They are both made with the same high quality Sunforger treated canvas. The Deluxe has two windows, a single zipper back door and a double zipper roll up front door with a mosquito mesh door directly behind it on it’s own set of zippers. The Standard model doesn’t have windows and has a single zipper front and back door. 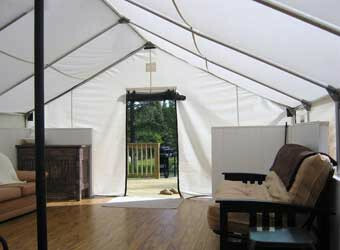 We can also build a tent with any number of options you would like. Q. What size of tent tent do I need? A. Using single cots the minimum for two or three people is 10′ x 12′ or 12′ x 14′. Four people is 14′ x 16′. Five or more will need the larger tents. The sleeping area takes up a lot of room so if you use the stacking XL Camo Bunks you can sleep more people and have extra floor space. Q. What is the floor made from? A. The floor is made from white fireproof tarpaulin. It acts as a waterproof ground sheet. It doesn’t attach to the tent. It lays wall to wall over the sod cloth and the frame legs hold it in place. Q. Where is the best place for the stovepipe ring? A. Although any position will work fine, our recommendation is the front left sidewall. If you want to protect your tent with a tarp there is no need to cut a hole in it by going out the side. You won’t have to deal with any water leaking around the stovepipe or creosote running down the pipe onto the tent. Sparks are much less likely to burn holes in the canvas. A few of lengths of vertical stovepipe outside the wall solves any draft problems with the stove. We include a stovepipe support with our tent and frame packages at no charge. Q. What is a clear removable window cover? A. They are made from the same clear window material used in boat tops. The clear cover attaches to the outside of the mosquito mesh window with velcro. You can have the canvas flap up and the clear cover on the window to allow light in and keep the cold out. They are easily removed when not needed in warm weather. Q. Why are there two doors in the tents? A. The back door allows you to put two tents back to back so there can be a cook tent and sleeping tent. It helps in the warmer months if you want more ventilation. We’ve actually had customers tell us they brought their quad into the tent through the large back door to work on it where it was nice and warm. Q. Are the frames strong enough to stand up to a heavy snow load? A. Our frames are very strong and under normal conditions withstand snow. We don’t recommend letting the snow build up for an extended period and it should be knocked off the tent before it gets too heavy. Our molded fittings are stronger than welded fittings which can bend under heavy weight. Q. Is the porch removable? A. Yes, the porch is removable. We sew velcro on all our tents so the porch can be added at a later date (free shipping only applies to the original purchase). Q. Do I need an internal frame or can the tents be hung externally? A. All tents come with grommets on the ridge and sidewalls for tying to an external frame. There are nylon loops along the bottom of the walls as well. If using an external frame always tie the whole tent to the ridge pole and then lift it up. Don’t try to lift the tent up by one grommet. Tie the sidewall grommets so that the flap is angled downwards to allow the water to run off. Q. With the internal frame do I need to anchor the tent? A. If it’s windy it’s a good idea, especially if the tent has a porch. We include rope with the tents. Q. How long does it take to set up a tent and frame? A. With an internal frame anywhere from 15-30 minutes, depending on how big the tent is. With an external frame it can take a couple of hours or more. Q. Are the Outfitter wood stoves airtight? A. They are virtually airtight. The Outfitter model can give up to 8 – 9 hours of heat when the fire box is fully loaded. Q. Should I use a tarp? A. We recommend using a tarp. It serves many purposes with a wall tent. It will shield the tent from UV rays which can be harmful to the canvas over a long period of time. It helps to shade the tent in the summer and insulate it in the winter. It will keep the tent dry when it’s raining and helps the snow to slide off. 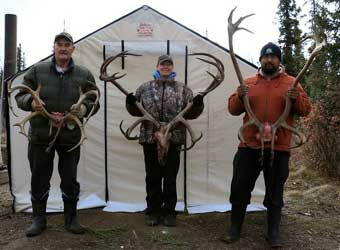 Keeping the tent dry means it won’t shrink which may result in the frame having to be shortened. 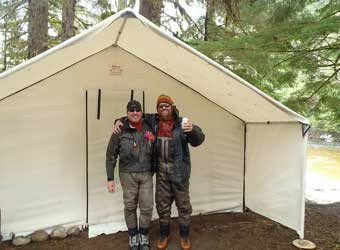 An oversized tarp can also provide a covered area outside the tent. A. 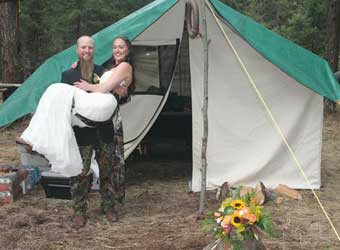 We recommend the tent and frame be assembled after you receive your order and before going into the bush. Occasionally things are lost in shipping or packaging and it’s better to find out before heading out. We want to ensure your camping experience is both safe and enjoyable.